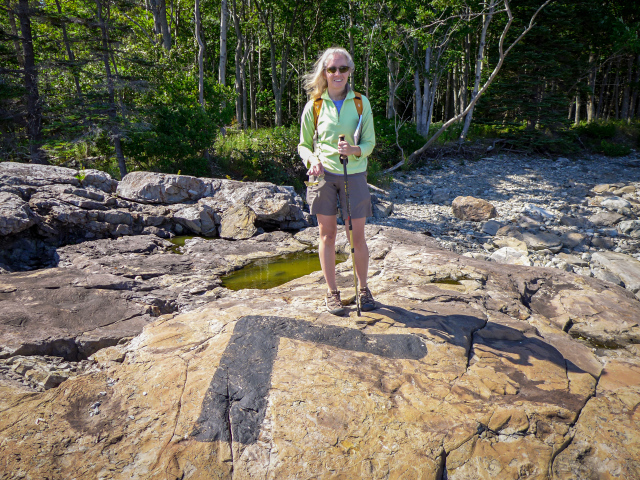 This large painted arrow may have been used for aerial surveying. This morning we got a slightly later start and, still full from last night’s feast, went for just a quick breakfast of bagels from Morning Glory. We had our usuals: multigrain with veggie cream cheese for Rich, and three-seed multigrain with spicy cilantro cream cheese for me. We sat on the benchmark bench by the waterfront. It was clearly going to be another gorgeous day, fully sunny but a bit cooler than the past two days, and it was quite windy early in the morning. We were plenty warm sitting together, nibbling on our bagels and watching the cruisers stroll by wearing their high-water pants. 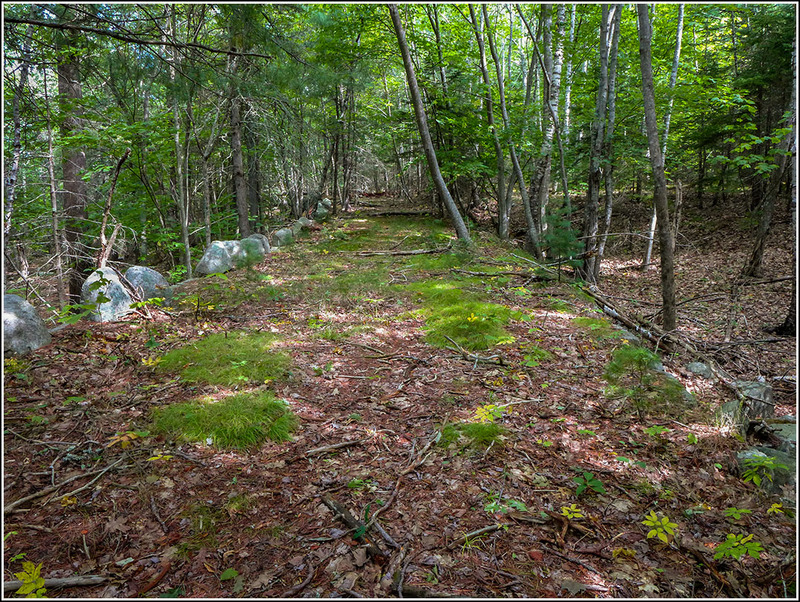 An abandoned road leads into the woods from a pulloff on Schooner Head Road. The beach was peaceful today! Where's George? In a tide pool! Zhanna finds a nice picnic spot. 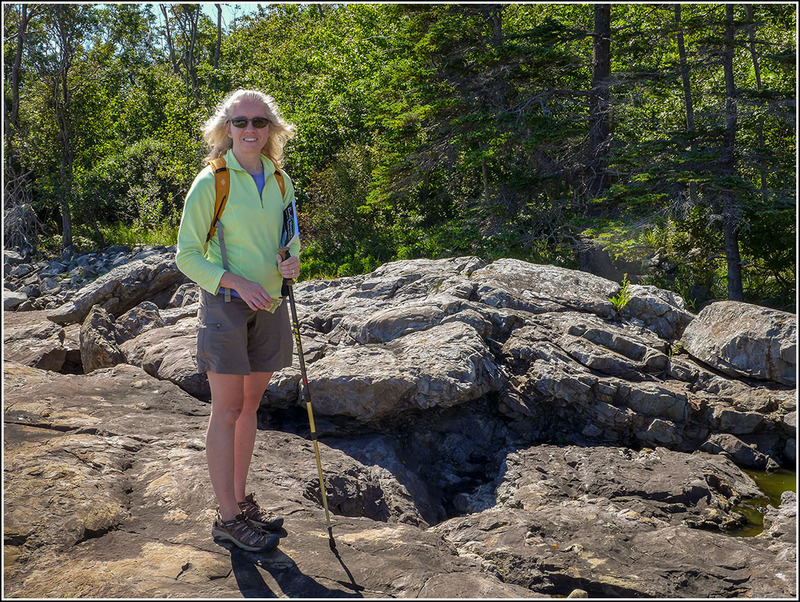 Zhanna investigates this outcrop, looking for benchmarks. 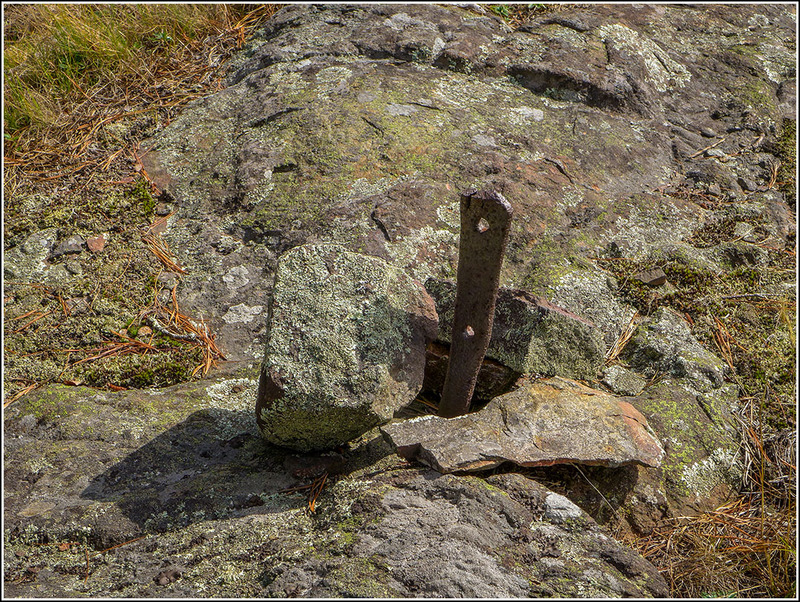 No benchmarks, but this "X" might have been used for aerial surveying? After some time we went back to the room to prepare for the day’s activities. 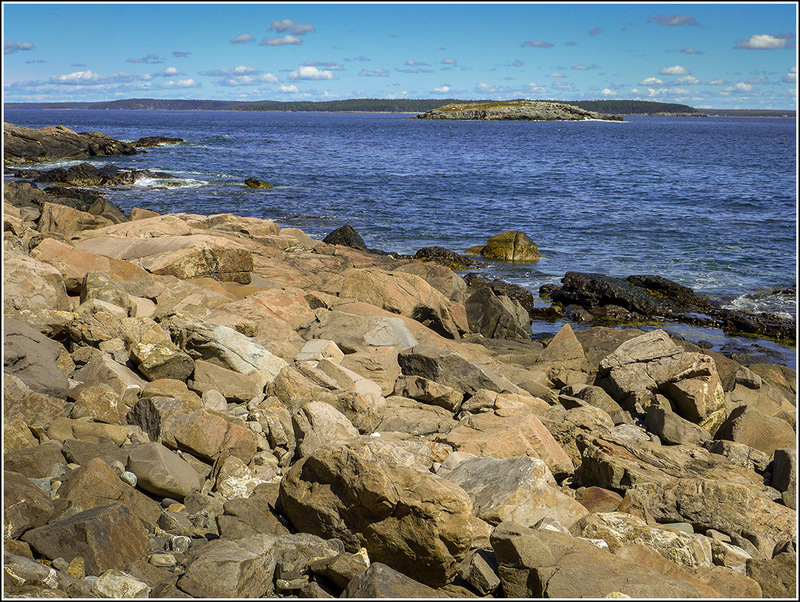 We took the bus to the Orange & Black Path and followed it east to Schooner Head Road. We’ve never been on this section of the Orange & Black, which was recently reopened. It’s a lovely path with lots of stonework and steps typical of Brunnow. 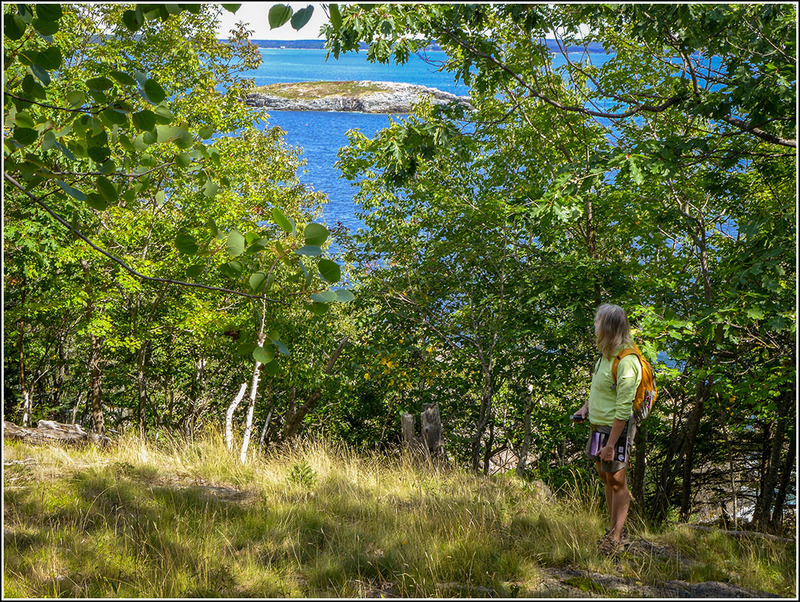 It descends through a surprisingly steep area on ledges and through open woods to the Schooner Head Path, which we then followed north for about four tenths of a mile. The Thrumcap is visible through the trees. 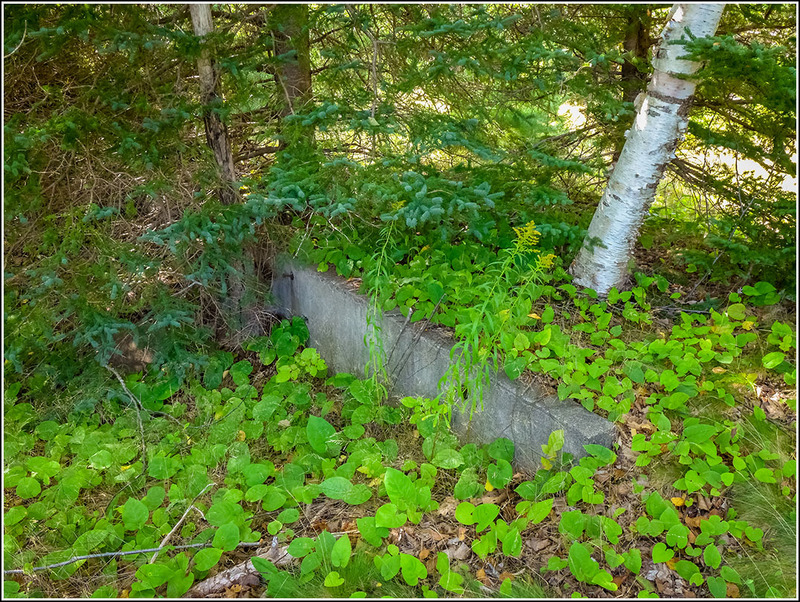 An old foundation, now becoming overgrown. 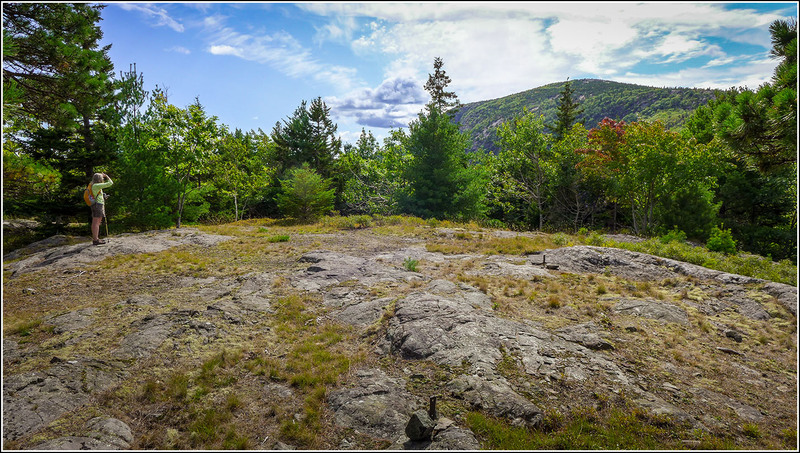 A large slab near Thrumcap Ledge, maybe once a patio? 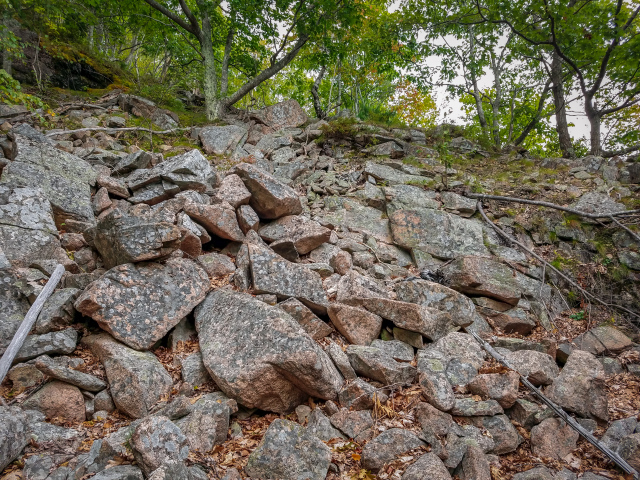 We stopped at one of three small pulloffs leading to the area we wanted to explore today—what Matthew Marchon calls “Thrumcap Ledge.” Following the directions in his book, we began at the middle pulloff and hiked in on the obvious road/path before us. We spotted the random pile of dirt and the two large downed trees that he mentioned in the book, so we knew we were on the right track. It was easy hiking after that. We found the road easily that leads down to the shore. Another road branches off toward the first pulloff, which features a large stone foundation right near the road. We followed this old road to see the foundation and make sure it would become part of our GPS tracklog. 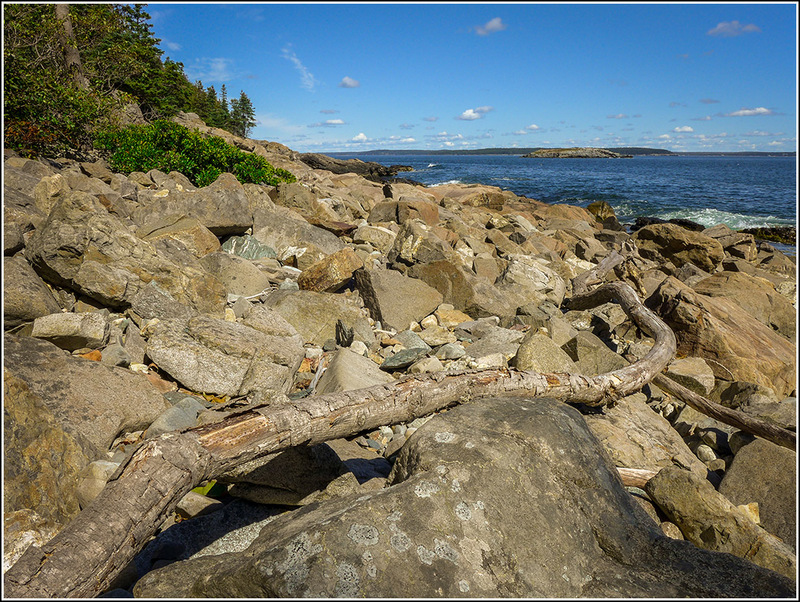 Then we backtracked and went down to the shore, which was awesome! 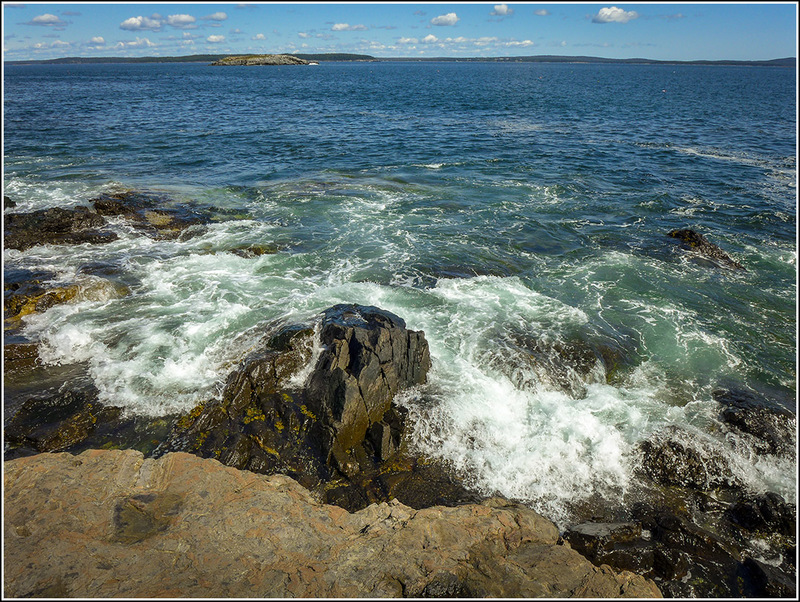 It’s a rocky beach with nice ledges for sitting, viewing the bay and the Thrumcap, and eating. Of course we had brought along a trail snack, a rhubarb and cheese danish from Morning Glory. 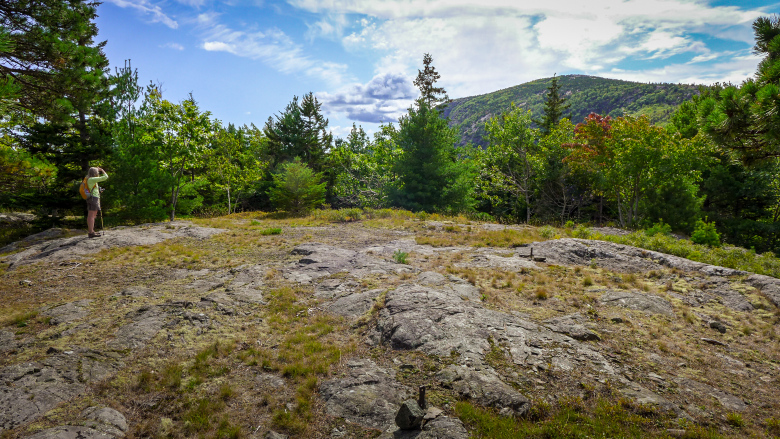 I went exploring on top of the ledges and pillars hoping to find a topo station or some other survey marker. 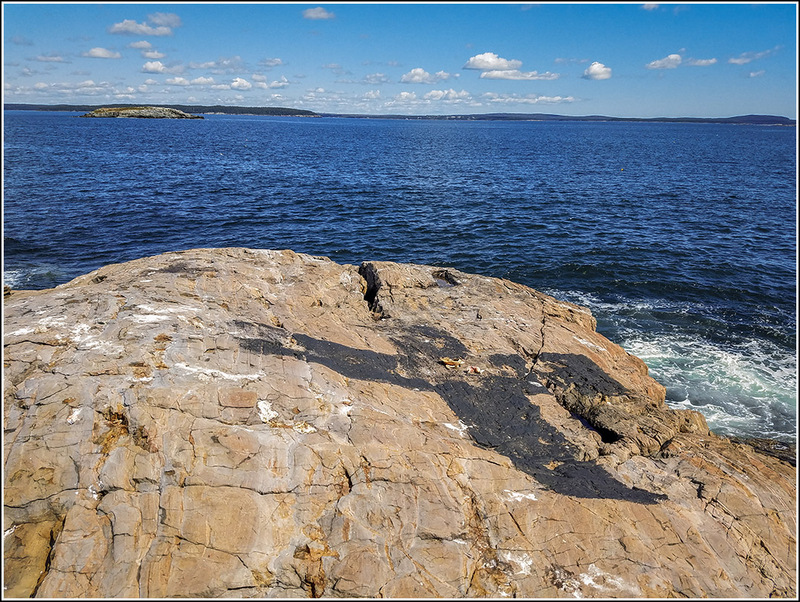 We didn’t find any disks, but we did find a black painted arrow on one ledge and a black painted cross on another—maybe markings used for aerial surveying? 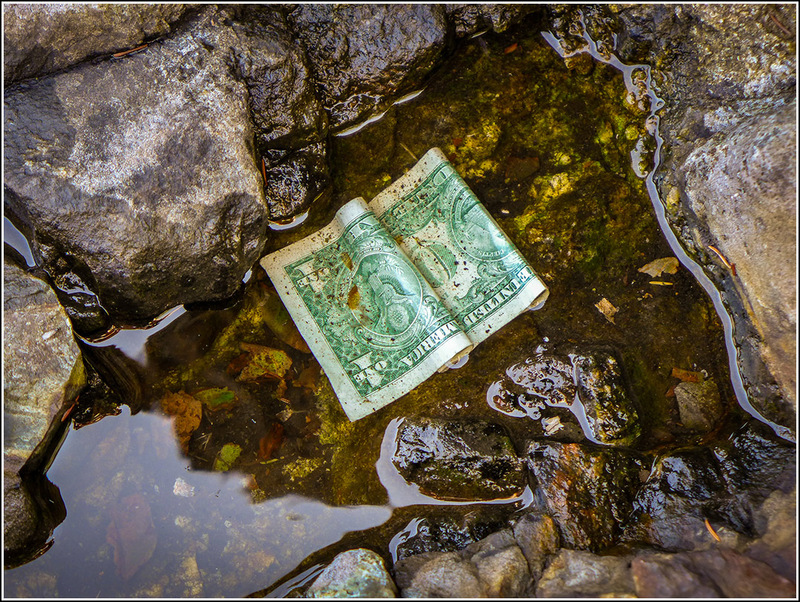 We also found a dollar bill in a small pool of water atop one of the ledges. 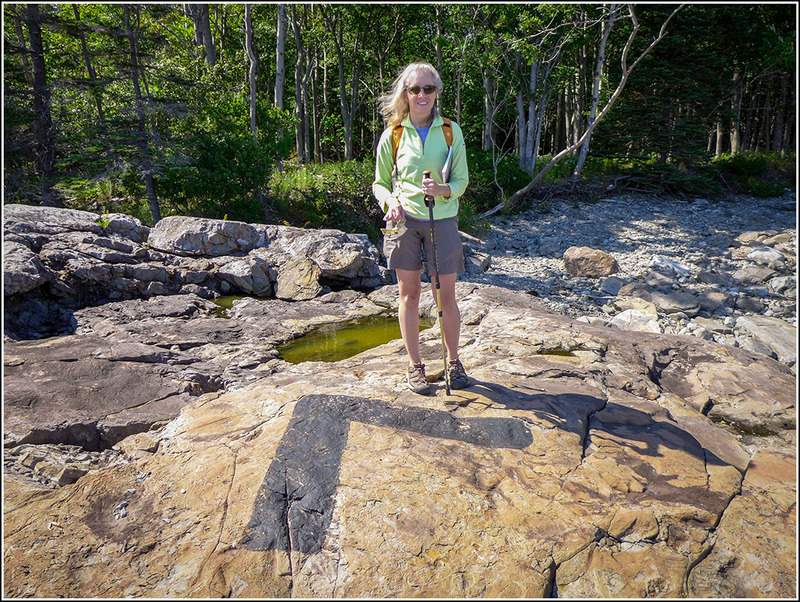 After hanging around on the beach for a while we headed back to the main path and out to the ledgy area where we found some granite foundation blocks, a large platform and several other constructed features. It was clear there had been some kind of a cottage or other building here. We opted not to go all the way out to the ledges this time, wanting to avoid any possible run-ins with poison ivy, which grows heavily in some parts of this area. After exploring here for a while, we backtracked out to the main road and headed north a tenth of a mile to the final pulloff. But we weren’t going to take the obvious trail heading directly into the woods. Instead we went north a hundred feet or so and headed up the old driveway instead. This is really an incredible sight. Huge high granite retaining walls line the driveway, supporting it as it climbs the small hill. The stonework is intricate and massive in scale and is lined on the top, in places, with large coping stones to indicate the edge. The driveway winds around and up and through the woods, getting narrower and a little overgrown as it reaches the top, though still quite easy to follow. 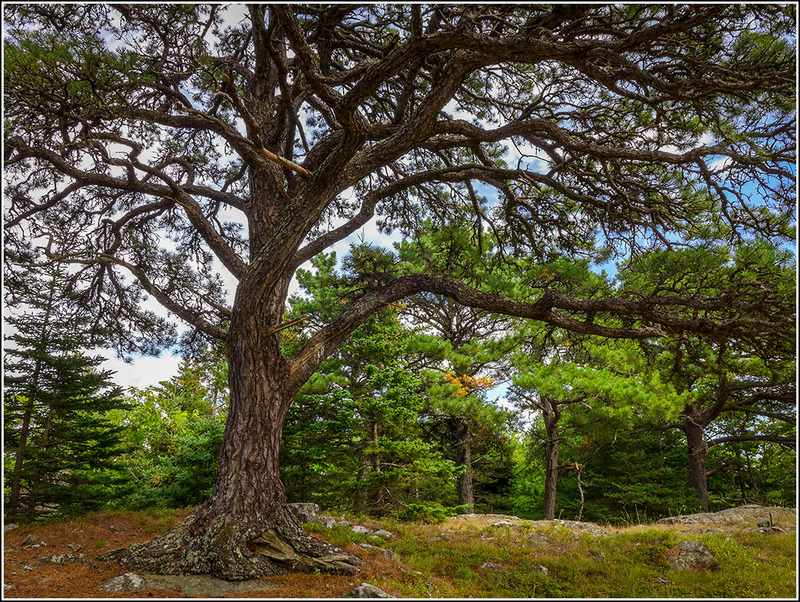 We emerged on the summit near a beautiful large pine tree that Rich immediately wanted to photograph. 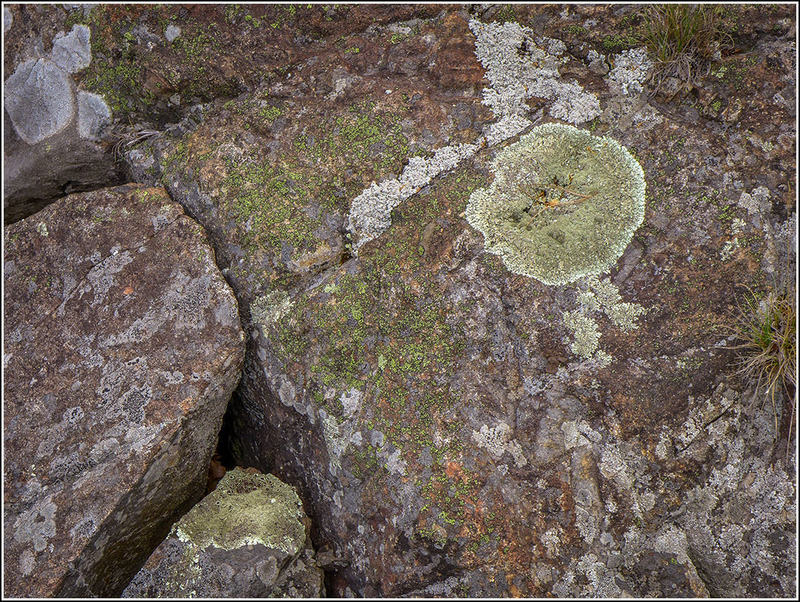 The summit was a nice open area with mossy lichen-covered ledges and no sign of a structure other than two embedded pins, the type that might have held a small cabin or shack against the wind. Strangely enough, we saw no sign of anything expensive or important enough to warrant such an elaborate driveway/access road! I still have no idea what might have been here. We’re going to try to find an old property map that might show more detail and who it belonged to. We spent quite a lot of time here, taking photos and exploring to find any other signs of human habitation, which we didn’t find. Impressive construction along the old driveway! The path of the old driveway is still clearly evident. 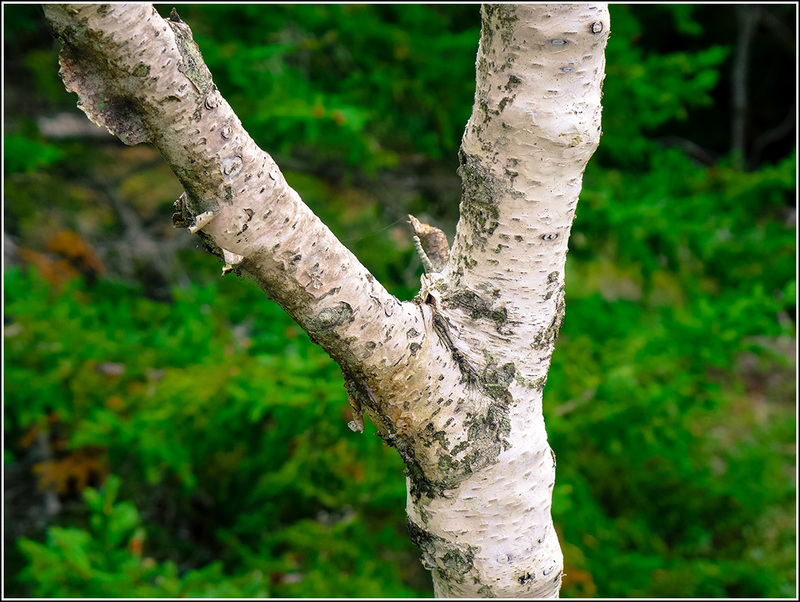 Rich really liked this tree and explored it from several angles. Rich looks around for interesting subjects! We followed the trail rather than the road back down the hill because we wanted to map out the trail too. “What’s this?” Rich asked near the top of the trail, pointing to something that to me at a distance looked like a can lid. It was actually a survey disk! 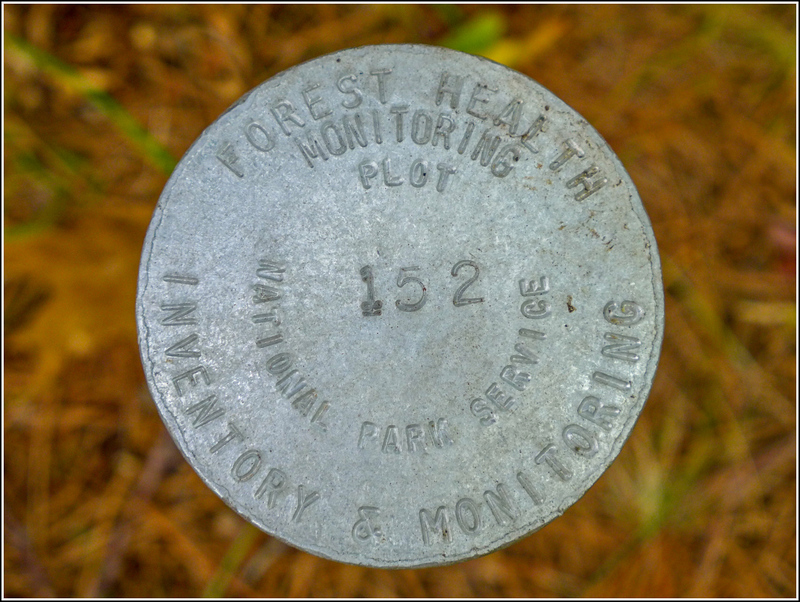 It was stamped “FOREST HEALTH” and was surrounded by tagged and blazed trees. Cool! 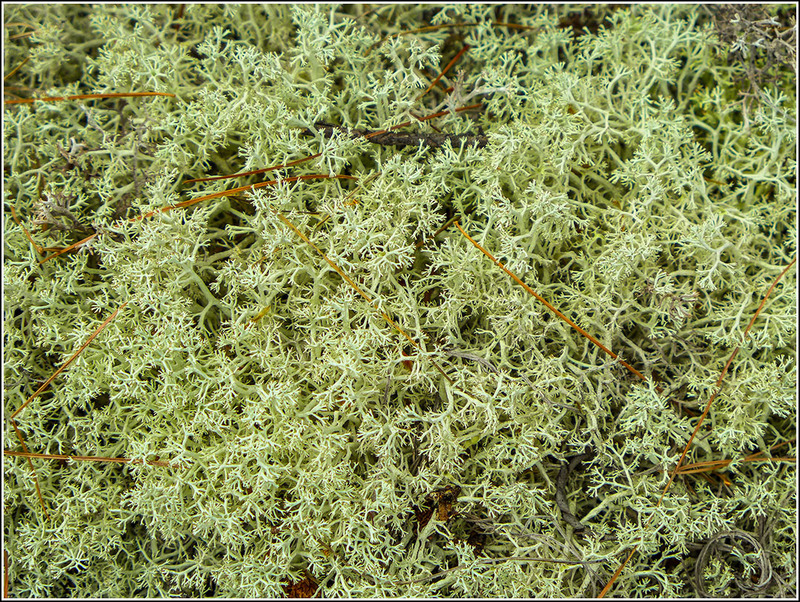 But the disk on its rod was just lying on its side, partially embedded in the soil and pine needle debris. We have no idea where it was supposed to be placed so we just set it in the ground, buried as deep as Rich could force it, next to one of the tagged trees. We stuck the rod and disk into the ground near one of the marked trees. 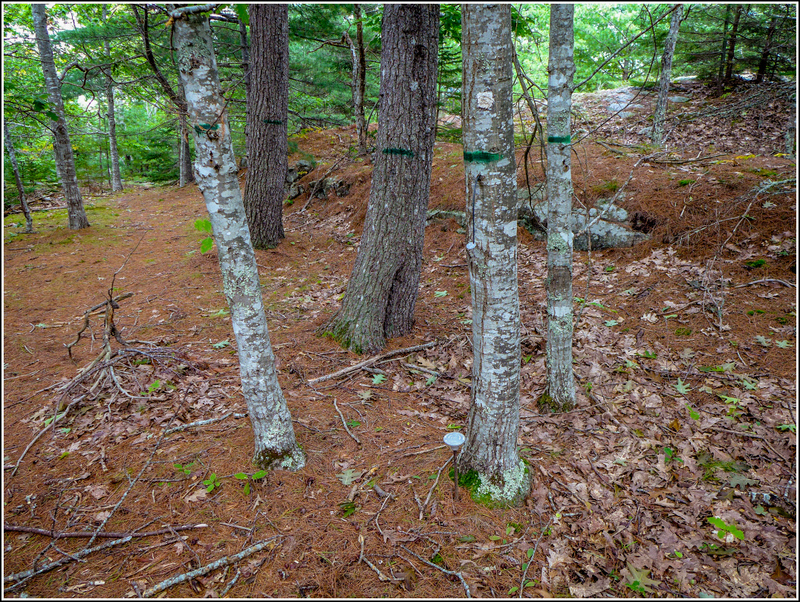 NPS maintains a website of Forest Health data: Northeast Temperate Network (NETN) Forest Health. 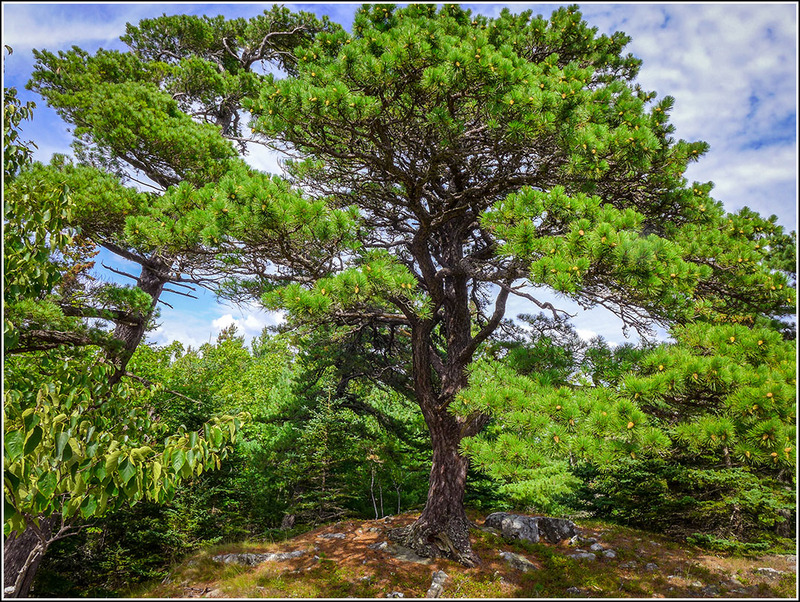 Their description and notes for station 152 are: Rolling Uplands. 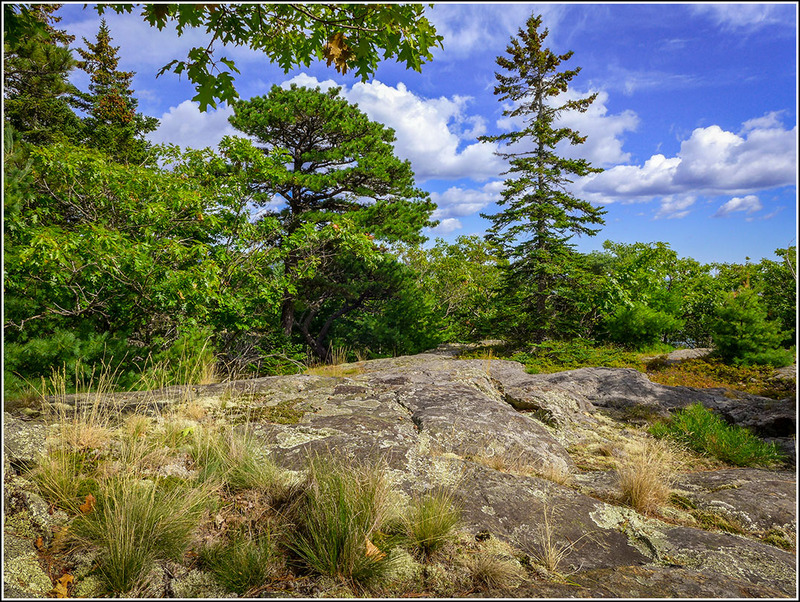 Red oak, white pine forest on rocky hilltop. 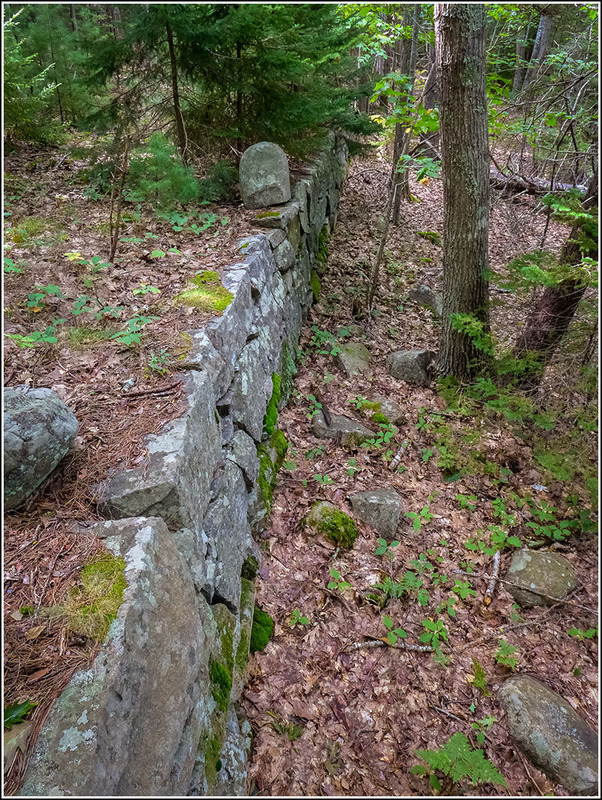 Rock wall and old road running through plot. 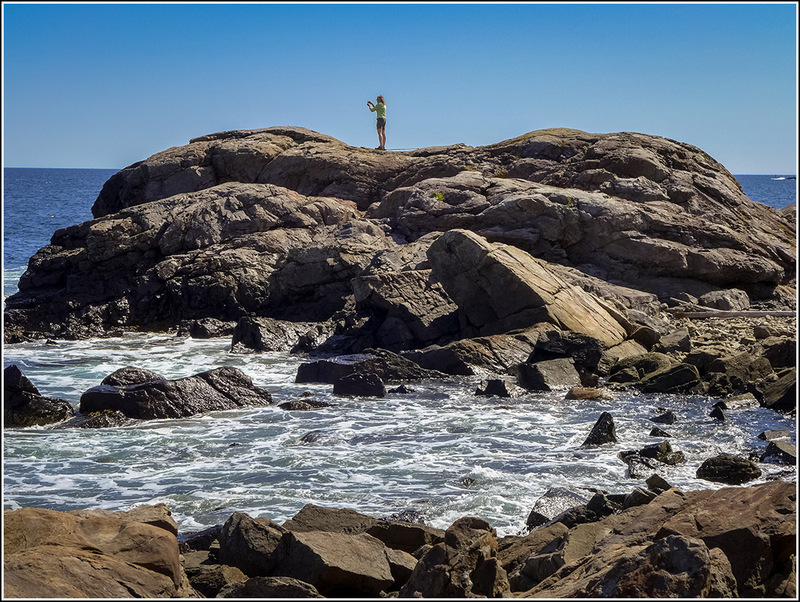 Back at the road, we crossed over and climbed up to the Schooner Head Path, which we took back to the Orange & Black, which we then climbed back up to the park loop road. 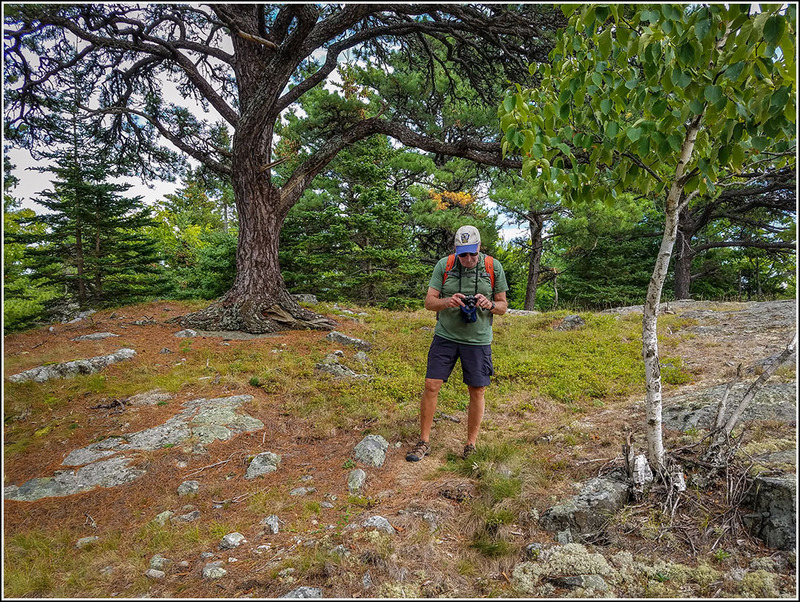 We had some time now to try to look for what J. R. Libby calls The Lost Rudolph Brunnow Trail. His directions were to find the first culvert, heading north, where you can no longer see the sign for the Precipice parking area—but we were coming from the other direction so this was a bit tricky. 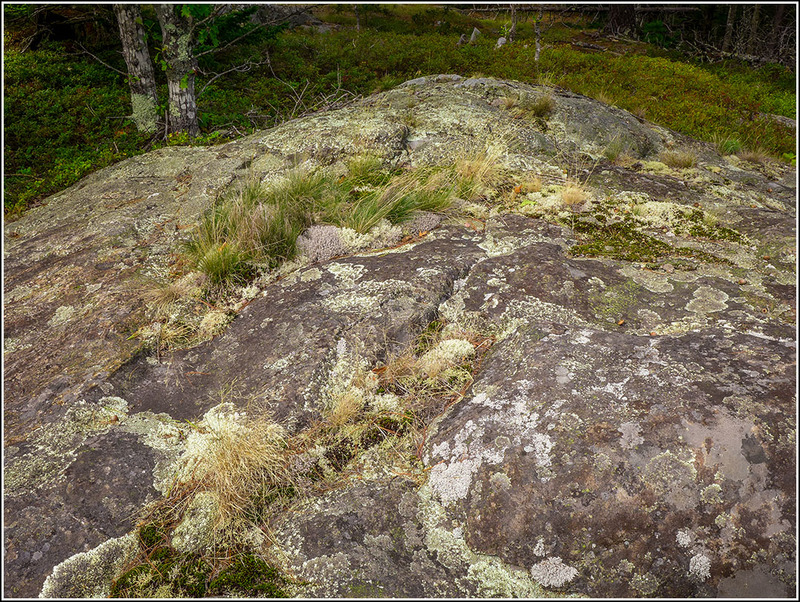 This “rocky gully” looked promising but it wasn’t the right spot. 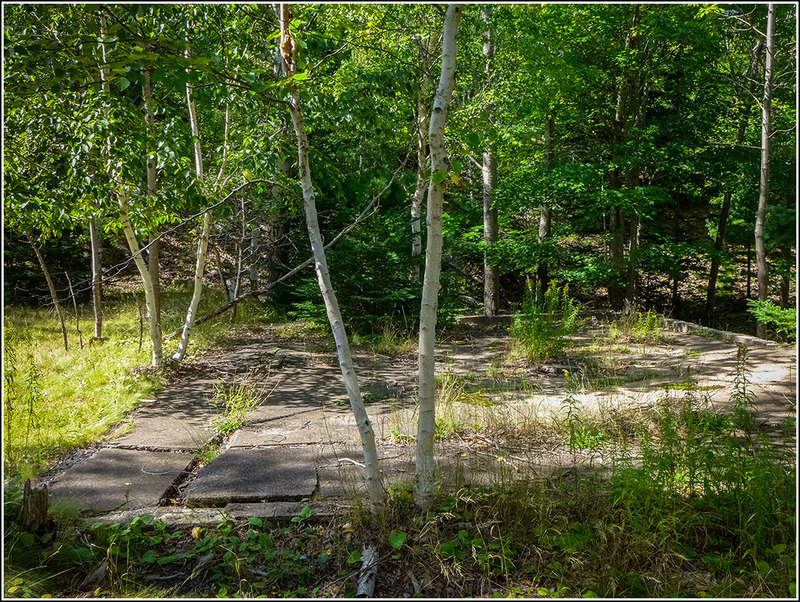 I went into the woods at two spots without finding much, but as we walked closer to the Precipice parking lot we could see that neither of these was the correct culvert. 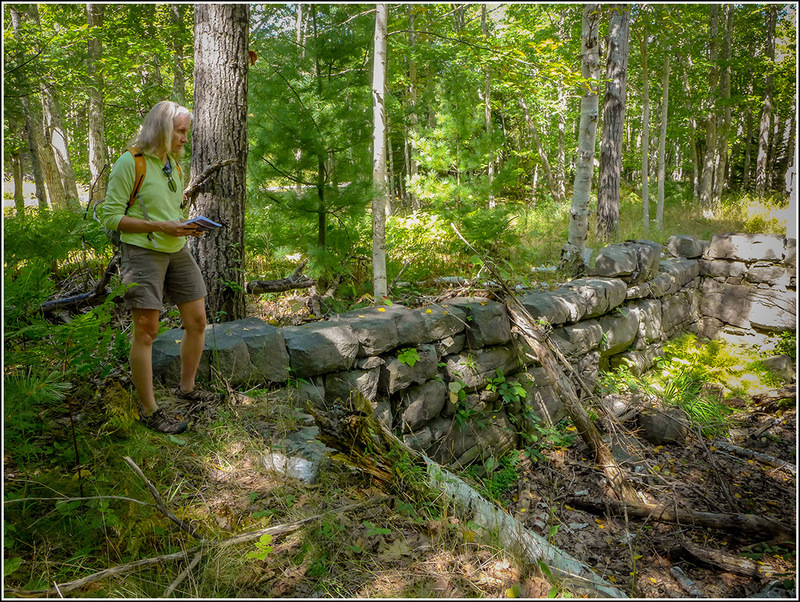 We think we eventually found the culvert where you can no longer see the sign, but it didn’t quite seem to match up with the other details given, such as a small brook leading into the woods and a rock gully at the base of the cliff. We were getting hungry and we wanted to catch the next bus, due to come by soon, so I didn’t go into the woods here, but I marked a waypoint for future reference. I can’t find any reference to a path going into the woods at that location in Pathmakers … however, it’s interesting that a map in Trails of History shows a trail, otherwise unaccounted for, leading west from the park loop road in the approximate location of the trail that J.R. and his son found. In thinking this over, I began to wonder if J.R. and his son might have found steps belonging to the abandoned White Path along the base of Champlain. J.R. went into the woods directly west from the park loop road and then found the steps, but it’s possible that his route west from the road wasn’t actually part of a trail, but that his route simply intersected a trail running north-south. Interestingly, Trails of History shows the White Path entirely east of the park loop road through this section, while Pathmakers shows it west of the park loop road through part of this section. 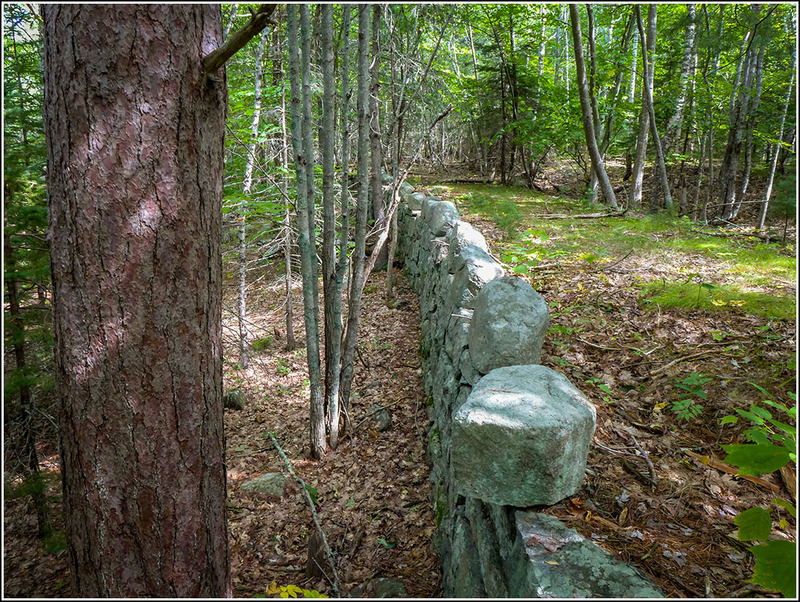 What J.R. found might have been part of the White Path if Pathmakers is correct. 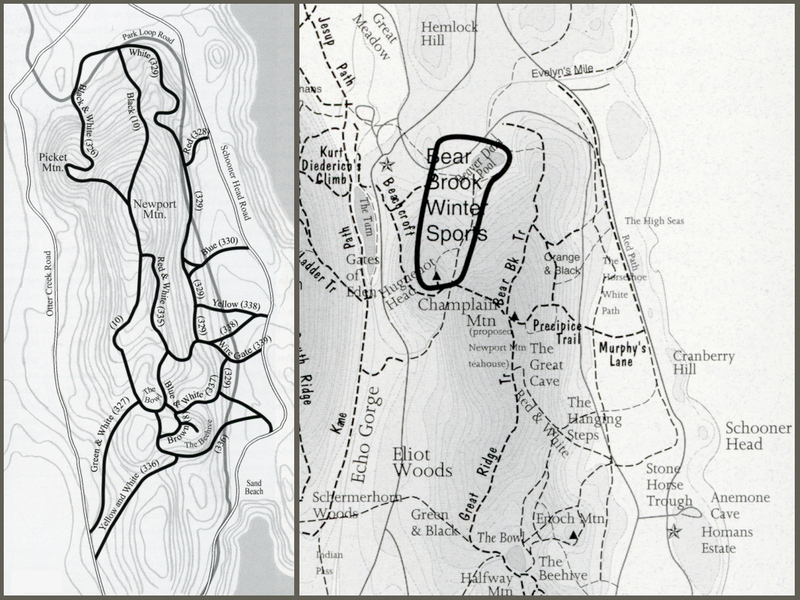 Maps from Pathmakers (left) and Trails of History (right). Note trail on Trails of History map that doesn’t appear on Pathmakers map, and discrepancy in location of White Path. We’ll save further investigations for another day, and do some more research in the meantime. 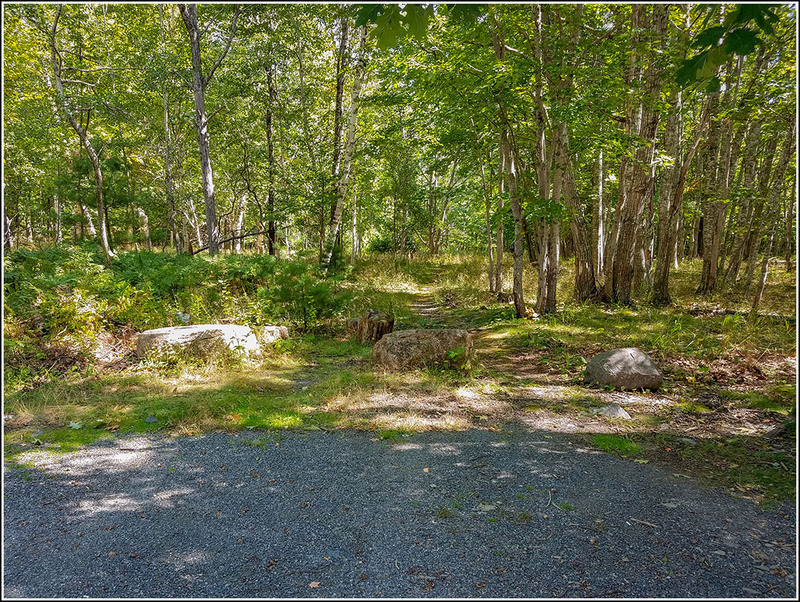 We took the bus back to the Village Green, of course passing through Otter Creek along the way where we attempted to look for the entrance to the Green & White Path on Otter Cliffs Road. The bus was moving too fast for us to spot it, but I think I saw “pole #9” that was referred to by my Otter Creek acquaintance Karen. (The entrance to the path is supposed to be between poles 8 and 9, but on the other—east—side of the road.) Also, on the way back up Route 3 I’m pretty sure we spotted another entrance to the Potholes Trail. It’s right at the south end of the long guardrail over Otter Creek. Back in town, we were both hungry and a bit chilled so we went directly to West Street for supper. 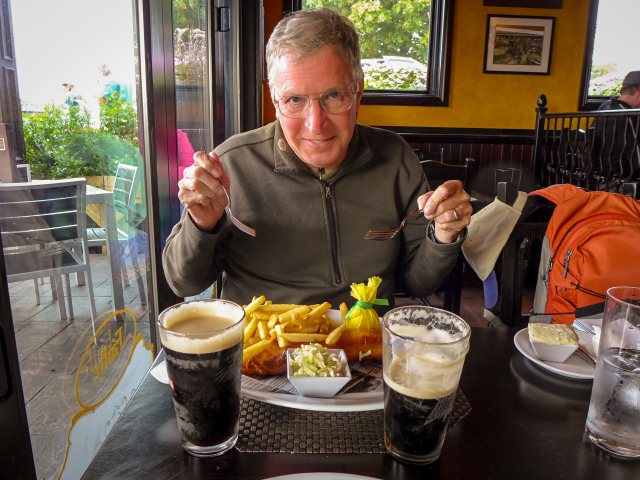 Feeling adventurous this afternoon, and hoping to satisfy Rich’s sudden craving for fish & chips, we tried a place that’s new to us: Paddy’s Irish Pub. 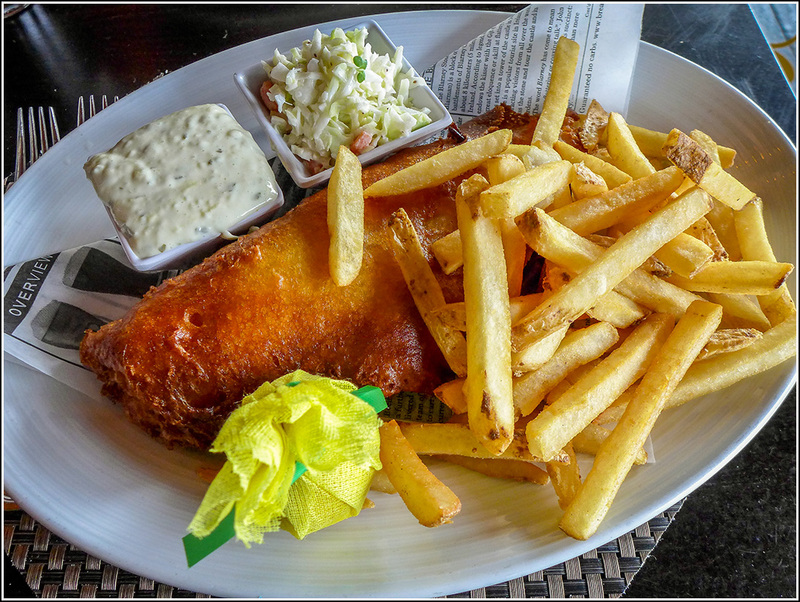 Reviews indicate that it’s a tourist trap, with its patio seating and views of the harbor, but you can’t argue with perfect pints of Guinness—topped with shamrocks, no less—and some of the best fish & chips we’ve had. 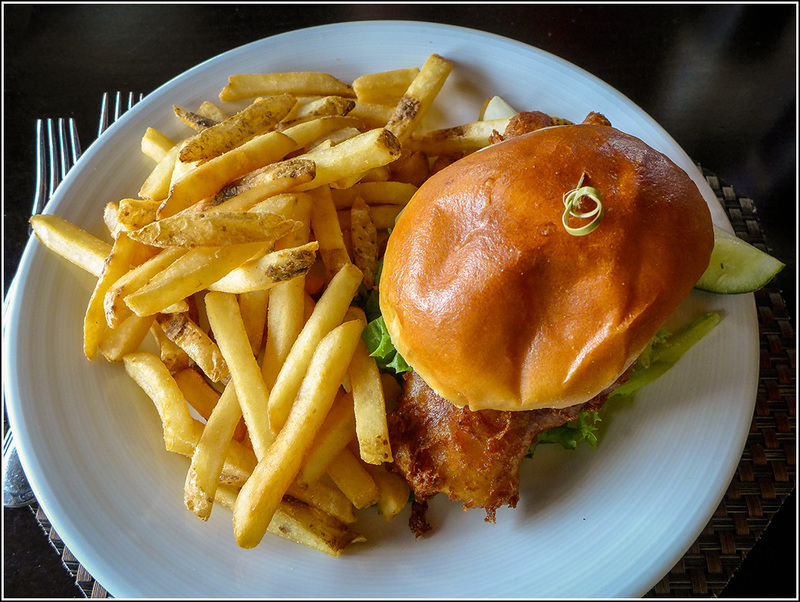 Yes, Rich found his fish & chips, while I had the Wexford fish sandwich which is the same fish (for some reason our waitress felt compelled to tell us this), just a little smaller, topped with aged cheddar, tartar sauce and greens on a toasted brioche bun. 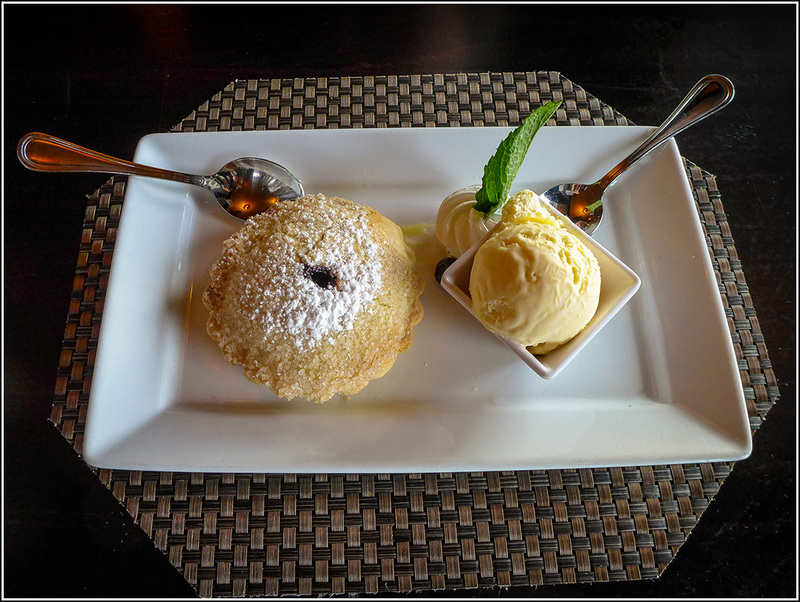 I was close to stuffed, but as usual I couldn’t resist blueberry pie for dessert! It was more like a tart with a butter crust, but very tasty. It came with a small serving of lemon curd and vanilla ice cream. The food exceeded our expectations, and the atmosphere was pleasant and pretty relaxing even though we were near the bar. Waitstaff were from various countries—ours was Russian—but we didn’t see any from Ireland, oddly enough. Back early at the room, we spent a hour or so going over old maps and developing some ideas about what the lost trail really was and how we might find it.